If you’ve been thinking about bringing mobile technology in the classroom, my advice to you is to do it! More k-12 and higher education institutions are participating in the “mobile revolution” than ever. There are so many benefits your students are missing out on if you don’t. Today’s students are tech-savvy. They get more engaged and really thrive when they are using mobile devices in the classroom. Regardless of the method whether you do it through BYOD (bring your own device), a 1:1 iPad initiative, or any other method make sure you get that mobile technology in the classroom. Here are 5 terrific benefits you will be missing out on if you don’t. First and foremost your job as an educator is to prepare your students for the future. Well in order to do so you need to incorporate mobile technology in the classroom. Working with mobile devices will not only be a part of their everyday lives as adults, but it will also be vital part of many career paths. Knowing how to appropriately use mobile devices is an important aspect in this increasingly connected world. The old days of looking for information in encyclopedias are long gone. Having mobile devices in the classroom allows students instant access to the latest news, information, statistics, etc. Virtually every question they have is at their fingertips, keeping them connected with what’s going on around them and ensuring they are always well informed with the most up-to-date information. Many textbooks are not the most relevant sources of information. Today’s generation has grown accustomed to instant, updated information. Textbooks can’t provide students with the latest information like a mobile devices can. Also, having digital textbooks on their mobile devices keeps students more organized and gives them easy access to their materials. No one likes lugging around big textbooks. Many digital textbooks are constantly updated and often more vivid, helpful, creative, and a lot cheaper than those old heavy books. 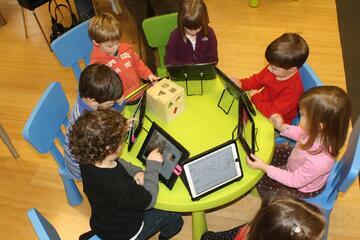 By allowing mobile devices in school you can expand learning outside of the classroom. Students will not only have access to information during computer lab time (which is also becoming extinct). They can look up information from anywhere on campus. Collaboration will increase as students can use these devices as research tools during projects and group work. 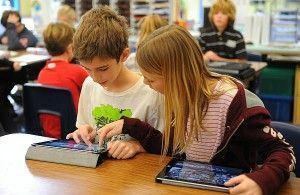 Plus students love technology so they are likely to be excited about it and continue learning outside of school hours. Having those learning apps, digital textbooks, etc. on mobile devices allows them to get in extra studying and learning in during downtime. They can carry their books and notes with them at all times and have instant access to materials. If students are really excited and engaged in learning inside of the classroom, they are likely to continue learning outside of the classroom and they can do so with mobile technology. It is remarkable how mobile technology can transform education into something more enthralling and engaging than you could of ever imagined. If you’re considering allowing mobile devices on your school wireless network, contact us here and we can walk you through the process and answer any of your questions.